At Inventive Resources Inc., we understand that success in business, family and community go hand in hand, which is why we are committed to serving and making a difference in our community, youth and mother nature. IRI is a supporter of Science, Technology, Engineering, and Mathematics (STEM) in the elementary and middle school level. Our staff volunteers locally with several meaningful programs and schools near our facility. We proudly support a variety of non profits that help mentor children in the science and math fields and provide scholarships to these students so they can pursue a degree in a science and/or math related field. Working with and supporting the community and non-profit organizations’ leadership is our way of giving back and remaining actively engaged in the communities in which we live and do business. The MATHCOUNTS Foundation is a 501(c)(3) non-profit organization that strives to engage middle school students of all ability and interest levels in fun, challenging math programs, in order to expand their academic and professional opportunities. Middle school students exist at a critical juncture in which their love for mathematics must be nurtured, or their fear of mathematics must be overcome. MATHCOUNTS provides students with the kinds of experiences that foster growth and transcend fear to lay a foundation for future success. For more than 30 years MATHCOUNTS has provided enriching, extracurricular opportunities to students and free, high-quality resources to educators. Every child is unique, but we believe all children are capable of seeing the beauty and joy of math, whether they come to us already passionate about math, or intimidated by it. There are many paths to math. We work to ensure that all students discover theirs. 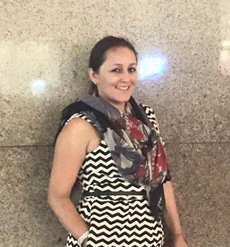 Evangelina Paoluccio PE/QSD has volunteered with MathCounts for the last ten years as the regional coordinator for the San Joaquin Valley region MathCOUNTS program. With sponsorship from the San Joaquin Engineer's Council, the University of the Pacific School of Engineering and other local engineering partners the San Joaquin Valley MathCOUNTS competition has been held historically on the 1st Saturday of February. This year the competition will be held at the University of the Pacific School of Engineering grounds in Stockton on Saturday February 6th. The Math Competition expects 60-80 MATHletes to vie for a chance to compete at the Northern California State Competition at Stanford University on March 2016. Future City is a cross-cultural program that lets students in the 6th, 7th, and 8th grades do the things engineers do: identify problems, brainstorm ideas, design solutions, test and retest, build and then share the results. How can the world be a better place? To answer it, 6th, 7th, and 8th grade students imagine, research, design, and build cities of the future that showcase their solution to a citywide sustainability issue. Past topics include stormwater management, urban agriculture, and green energy. 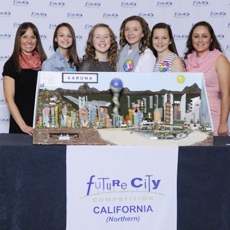 Every year over 35,000 students participate in the Future City Competition, representing over 2,200 teams from various middle schools and groups nationwide. Thirty-seven regional competitions are held in January annually across the United States. Each year participation in the program is increasing significantly. This year’s topic: waste management. Inventive Resources has volunteered its facility, mentorship and time to several local teams. In 2013 and 2014 Girl Scout Troop #2225 became the first Troop and non school to compete at the National Finals. Under the engineering mentorship of John and Evangelina Paoluccio this team of girls placed 1st place at the State Competition, representing Northern California at the National Finals. 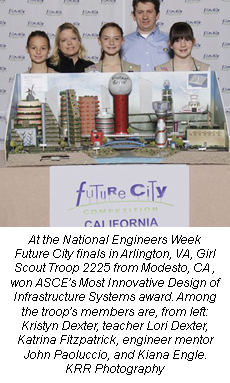 Both years at Nationals, Girl Scout Troop #2225 received a American Society of Civil Engineer award for Most Innovative Design of Infrastructure Systems. Girl Scout Troop #2225 placed 5th at the National Finals in 2014! Its IRI's hope that programs like Future City will help nurture our youth to become resourceful individuals that will innovate the world. EYHN is a 501(c)3 nonprofit organization dedicated to providing gateway STEM experiences to middle and high school girls that spark interest in STEM activities and careers. 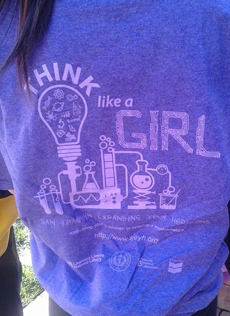 EYH is guided by the understanding that engaging with female STEM role models and participating in hands-on STEM activities can help girls begin to see themselves pursuing STEM activities and careers.The Expanding Your Horizon (EYH) Network began in 1974 as the Math/Science Network, an informal group of women scientists and educators in the San Francisco Bay Area who were concerned about low female participation in math courses. On a volunteer basis, members of the group began planning coordinated efforts to strengthen their individual programs and to offer mutual support. The conferences expand the horizons of girls from a wide range of backgrounds. All the girls learn about possible careers and, most important, learn that they could pursue such careers - careers that are enjoyable, pay well, and contribute to society and that are peopled by adults with active, fulfilling lives. The conferences serve as a gateway to additional STEM activities for the girls. Many alumnae say that their attendance at an EYH conference was instrumental in their eventual choice of a serious STEM career. Currently, there are more than 80 conferences with up to 25,000 girls attending each year. There are conferences in 31 states in the U.S. and in Europe and Asia. The EYH Network is a volunteer community of STEM professionals, educators, parents, community leaders, and government and corporate representatives from around the world. Financial support comes from donations, sponsorships and grants made by individuals, corporations, foundations and government agencies. Individual conferences fundraise locally for their conferences and the National Network Office fundraises nationally to financially support local conferences, start new conferences and provide direct services to the network of conferences like a free registration system. 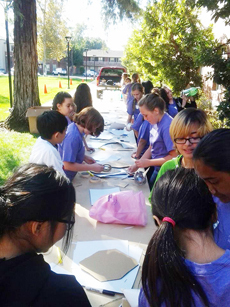 Inventive Resources has volunteered for several years at the local San Joaquin Expanding Your Horizon program held at the University of the Pacific in Stockton. IRI believes in the mission statement of Expanding Your Horizons, "Inspiring girls to recognize their potential and pursue opportunities in science, technology, engineering and mathematics". Monarch Butterflies are beautiful creatures from nature. Development (subdivisions, factories, shopping centers, etc.) in the U.S. is consuming habitats for monarchs and other wildlife at a rate of 6,000 acres per day - that's 2.2 million acres each year, the area of Delaware and Rhode Island combined. Widespread adoption of herbicide-resistant corn and soybeans has resulted in the loss of more than 80 million acres of monarch habitat in recent years. The planting of these crops genetically modified to resist the non-selective systemic herbicide glyphosate (Roundup®) allows growers to spray fields with this herbicide instead of tilling to control weeds. Milkweeds survive tilling but not the repeated use of glyphosate. This habitat loss is significant since these croplands represent more than 30% of the summer breeding area for monarchs. The use of herbicides and frequent mowing along roadsides has converted much of this habitat to grasslands - a habitat generally lacking in food and shelter for wildlife. Although some states have started to increase the diversity of plantings along roadsides, including milkweeds, these programs are small. Unfortunately, the remaining milkweed habitats in pastures, hayfields, edges of forests, grasslands, native prairies, and urban areas are not sufficient to sustain the large monarch populations seen in the 1990s. Inventive Resources Inc., is doing their part by volunteering at their local elementary school and helping educate young children on the importance of Monarch Butterflies in our eco system. 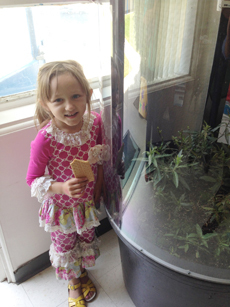 IRI has constructed and donated a large interactive Monarch Butterfly Garden display to Stanislaus Elementary School. IRI is also planning by 2016, installing a Monarch Butterfly garden at their facility and becoming a certified Monarch waystation. By creating and maintaing a Monarch waystation we hope to help in the efforts to Monarch Butterfly conservation and assure the preservation and continuation of this intriguing species and its spectacular migration phenomenon. What You Can Do to offset the loss of milkweeds and nectar sources we need to create, conserve, and protect milkweed/monarch habitats. We need you to help us and help monarchs by creating "Monarch Waystations" (monarch habitats) in home gardens, at schools, businesses, parks, zoos, nature centers, along roadsides, and on other unused plots of land. Without a major effort to restore milkweeds to as many locations as possible, the monarch population is certain to decline to extremely low levels. 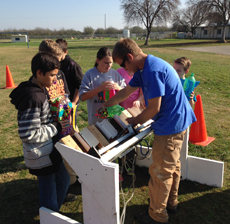 Kids learn about rockets with a launch stand.